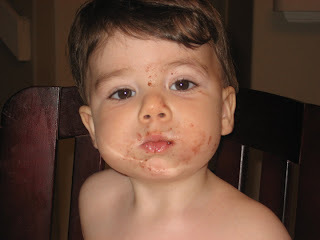 nothing better than peanut butter & blackberry jam toast...and blueberry yogurt...and bananas...all over the face of a sweet little boy! it has been toooooo long since i've uploaded photos of harrison. (did that "toooooo" bother you, dalene?) my poor mother (in china) has been pestering me for months about needing to see her grandchild. being the bad daughter that i am, i have not yet obliged her. so, just prepare yourself for image-overload. I'm prepared. Bring on the images!! Love the pics...keep them coming. To get to my two points, I'll add a comment, too. First, To use too in such a way with two "o's" is too creative for words. Next, Too many people listen to the wrong crowd and are too afraid to use "too" in creative ways. To be perfectly frank, your use of too is toooooooooooo perfect for your post.